Renault-Dacia Explorer allow you to add a blank key or card for many of Renault and Dacia cars via OBD-2 socket. You DO NOT NEED any PIN code! Software would program keys/cards AUTOMATICALLY. 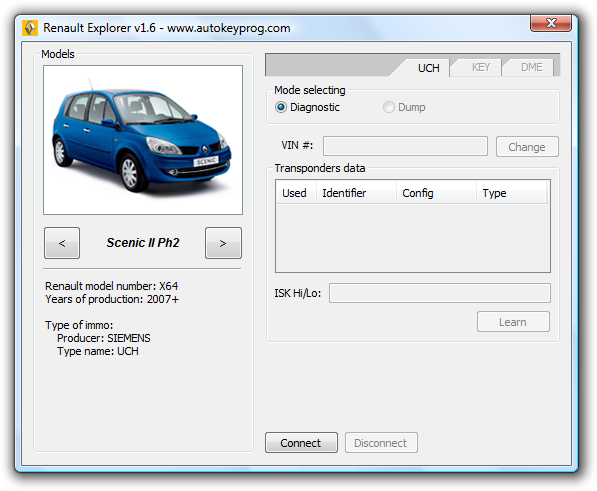 Also, you can change VIN number in UCH module (immobilizer), for example, if your UCH module was previously used on another car. Very simple and user-friendly software interface You do not need any PIN codes or access to Renault.net You can program up to 4 blank keys/cards Automatic remote control unit programming You can change VIN if immobilizer module was used previously VIN checksum check. Clio III, 2009+ - new!!! Laguna III, 2009+ - new!!! Megane III, 2009+ - new!! !